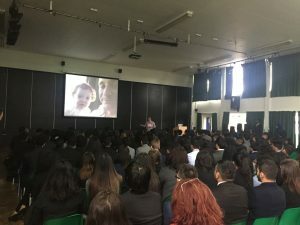 Earlier this year, I received a phone call from a lady called Hardeep Sambi at Mayfield School in Dagenham, inviting me to attend a school assembly for their sixth formers and give a presentation on Team Margot. I hadn’t given a school presentation before. 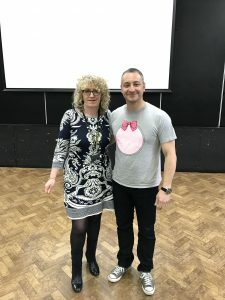 Margot’s auntie Nadia has delivered the vast majority of Team Margot school talks hitherto and mainly to children of Primary school ages; our school visits tend to be on an ad hoc basis, given that the charity doesn’t have the resources to give structured school presentations in this way. 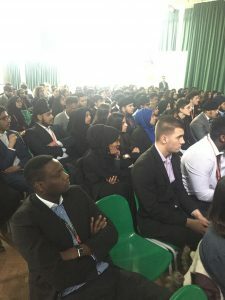 I was delighted to receive the invitation – which came about following a suggestion from one of Hardeep’s colleagues, Tina Vorley – and agreed straightaway, not just because I was excited at the prospect of my first school presentation, but also because the majority of the 300+ sixth formers at Mayfield school are ideal candidates to join the stem cell registers, given that they stem from black, asian, mixed race and minority ethnic communities. Nothing on donation was ever presented to me when I was a boy and I find it encouraging that schools today are increasingly willing to include this within the sphere of learning. 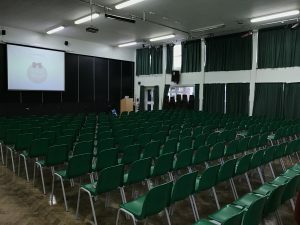 So on the morning of 22 March, I found myself standing in a large assembly hall rather nervously awaiting the students arrival and wondering how they might react and respond to what I was going to tell them. During my introduction I explained how fundamentally, I feel as though I am a “lucky guy” because good things, positive things tend to happen to me. As such, I always used to think: “It’ll never happen to me”. And then of course, “it” did happen, and for me, “it” was my daughter, Margot being diagnosed with blood cancer. It seems this statement resonated with many of people in the room that morning, in particular a young lady called Rim Ali, who later that day heard the shocking news from her cousin that their mutual friend, Omar who lives in Larache, Morocco had been diagnosed with leukaemia. Rim contacted me shortly afterwards to relate her news and it was heartening to learn that family and friends of Omar were rallying around to help in whatever way they felt able. In my experience, these situations do have a habit of bringing out the best in people. Every 35 seconds, someone in the world is diagnosed with blood cancer. And for many, a bone marrow transplant represents their only chance of survival. During such acute situations for the patient and their family, just knowing that a matching donor exists and a bone marrow transplant is an option can save everyone involved a great deal of anguish and despair. How do I even begin to explain the impact your presentation left on the kids. They have been moved and would like to have an association with Team Margot forever – is what they have said. I do not mean to patronise but you have such strength of character and this is what really made an impact with them – the strength you have shown. They were impressed and inspired also very respectful of your journey. I already have a list of activities they have planned the week prior to the 7th October and teams of students wanting to take ownership of ‘Team Margot’ at Mayfield. I have never seen/heard the passionate feedback I received this week. The students have been talking to their families and want them to get involved – it has been super! If it is OK with you the students would be sharing their views with us to share with the other members of the sixth form would it be OK to pass this on to you and your team? I will also forward the photos and short clips I filmed. We hope to stay in touch and learn a lot more about all the fantastic work Team Margot are doing – we also hope to always be a small part of this. 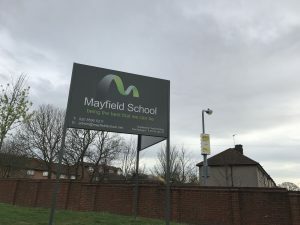 I look forward to hearing more from the students at Mayfield School and to sharing their efforts with you.